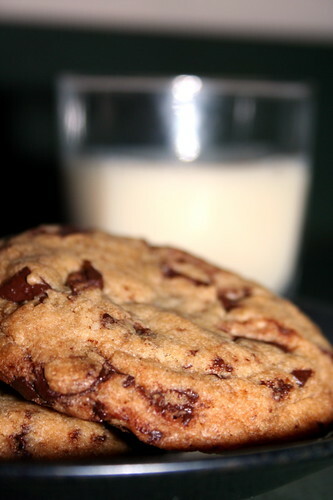 Sometimes I just want a chocolate chip cookie. I used to make the best cookies before I was vegan. My recipe was infallible. It was better than my mother’s–who was a professional baker for 20 years. And then I became a vegan. I’ve yet to find a recipe I like. Half of the reason is because buying vegan chocolate chips is so expensive. And the eggs really added something to the recipe, I guess. So here’s one of my experiments–with egg replacer. I don’t like egg replacer, but I was out of bananas. So, well, the recipe is good, but it’s not perfect. I also used 3 oz of semi-sweet baker’s chocolate instead of chocolate chips because that’s what I had. Needless to say though, these cookies made my paper writing and novel reading afternoon a-ok! 1 c Earth Balance, at room temp. Mix the Earth Balance, sugars, vanilla, and egg replacer. Add the chocolate chips or baker’s chocolate. Love your blog.I think I’m going to give these suckers a test run this weekend.I’m in the mood for Chocolate Chip cookies!